In which you've already seen most of this stuff. I researched Construction 6. I was going after Daughter of Typhon related goals pretty single-mindedly for such a long time, and trading with Hinnom to get most of what I needed. Now that I have the Daughter and builds character is charging me more than cost for trades I figure it's time to make most of my stuff in-house. This is a random event, but it's also a spell available to Pangaea and Arcoscephale (and Marverni but that nation isn't in this game). At the time I was worried that Irony.or.Death might have made another deal regarding the defensive pact and this was a probing first move. He assured me that was not the case, and I believed him. After all, if he were going to make a first move then it would have been like twenty monster boards and a whole bunch or satyr attacks and revelers inciting unrest and Maenads rushing over the borders and such. Even so, I was by this time extremely uncertain about the wisdom of remaining allied to Hinnom, and I was quite paranoid that IoD or Incy might put together a new coalition against builds character and myself. Around this turn, if either of them had approached me about such a thing then I probably would have joined. It was early enough to have a chance at winning and late enough that I felt confident that I could survive it. I was not about to start such a coalition on my own, because I felt the risk of being caught double-dealing was too costly. I didn't think that the monster board belonged to Arcoscephale of course because this was the turn that nation was defeated. More on that later. For now, let's talk about my newest royal! Bathusma is not amphibious (only the Queen of Lakes has that ability) so I will need to give her an Amulet of the Fish to get her out of the water. However she has a solid framework on which to hang gear and she is W10. W10 gets me a whole hell of a lot of Living Water, Falling Frost, or Cleansing Water. 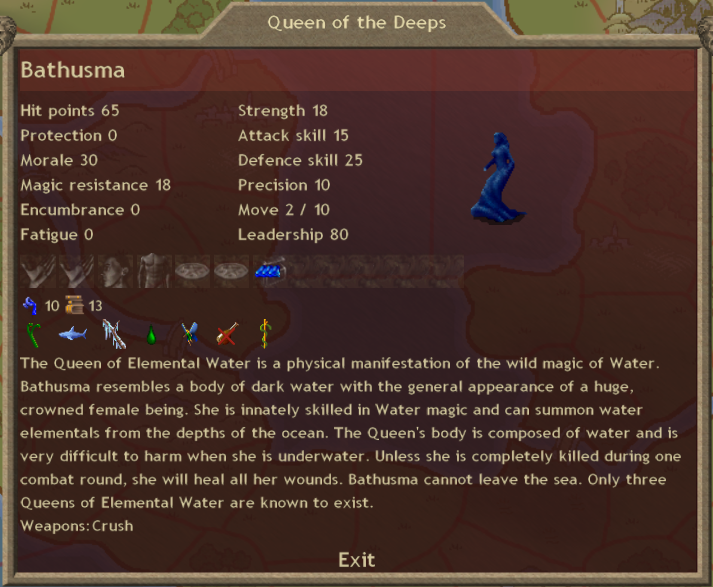 In fact Bathusma alone could defeat nearly any army of demons or undead arrayed against her with Cleansing Water, and if I put her together with the other Queens of Water then I never have to worry about demons or undead again (at least not while they are present). As the queen of a pure element (like my King of Fire) she gets 3 gems of her element each month. The mixed-element royalty get 1 gem of each element. Assuming I can keep myself and my royalty alive, each one pays for itself in about 17 turns (not counting the devastation they can visit upon my foes). At this point my maps circumnavigate the globe on the north-south axis. If you go south off the southern edge of the map, you will wrap around to the northern edge. 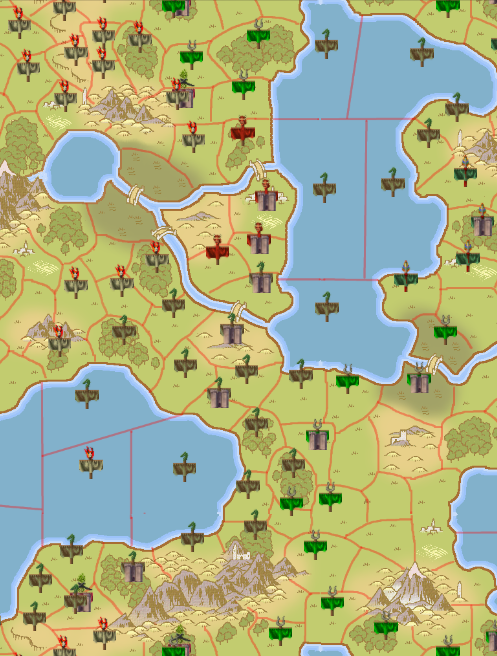 If you look very closely ou can see that T'ien Ch'i has three forts left, and all of them are under siege (one by me, two by Hinnom). I'm not really qualified to give a post-mortem on other nations. As I mentioned at the beginning of this game, I'm a bit like Feinne in that I know more about modding than I do synergy and forging and scripting. On top of that I barely interacted with Dexanth during this game, so I can't even really talk about what I saw firsthand. As long as Wrath of God was up I am really curious about whether it actually did anything to Mictlan. Otherwise I don't have much to add! Sadly, I don't have time to put more than this one turn up this week. As you guys might imagine, the turns should be getting shorter and simpler for a little while. In fact, we might even be able to finish posting all the turns for this LP by the end of the year... or even by the end of November if we're all really ambitious. Basically what I'm saying is that my personal goal is finish my contributions to the LP within 1 calendar year of when the OP first went up. You know what? That sounds like an Irrational Objective! 6. Make my final contribution to the LP (no slacking off!) on or before December 12, 2012.